Riley doctor. Riley dad. Riley donor. 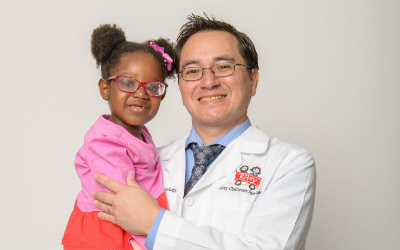 Pediatric neuro-oncologist Dr. Alex Lion’s tenure at Riley Hospital for Children at Indiana University Health took an unexpected turn in the spring of 2017, when his then-2-year-old daughter, Kynslee, became seriously ill.
Kynslee―whom Dr. Lion and his wife, Janna, had adopted months earlier―was admitted to Riley’s Pediatric Intensive Care Unit (PICU) in severe septic shock, a widespread infection that causes dangerously low blood pressure. After seven days on a ventilator, Kynslee suddenly went into cardiac arrest. As a parent, Dr. Lion could only stand by and watch as the PICU team worked to replace a clogged breathing tube. Kynslee was without oxygen for more than two minutes. “I remember my wife and I asking each other, ‘What will happen to her when she survives... if she survives? Will she have brain damage from the code?’” Dr. Lion recalls. In the weeks that followed, Dr. Lion and his wife sat vigil by Kynslee’s bedside. It was during that trying time that Dr. Lion says he became more aware of the inner workings of the hospital. That included the impact of some of Riley’s less-recognized team members, from the chaplain who sat with Janna, to a member of the cleaning crew who brought in hair products to keep Kynslee’s hair from falling out as she laid in bed. “I tell Janna, it’s like the heart of the hospital opened up and kept us safe,” Dr. Lion says. After 21 days, Kynslee no longer needed the ventilator, and despite the scare of her cardiac arrest, her family was relieved to learn that she suffered no permanent damage. Using genomic testing, doctors discovered that Kynslee has a rare mild bone marrow failure syndrome called Shwachman-diamond syndrome. There is no cure, but knowing about the condition will help her family keep Kynslee, now 4, healthy as she returns to preschool and plays with brothers Jordan, 5, and Samuel, 7. For Dr. Lion, the experience inspired him to give back to Riley Children Foundation by donating, and it has also changed the way he approaches helping patients heal. Are you an employee at Riley Hospital for Children? If so, visit RileyKids.org/MyGift to make a donation today. If not, visit RileyKids.org/Donate to make a donation today.